Snapshots of Life Lately — Yadi's Journal | All things love. All things home. Taking it back a little -- this is the last image I took while still pregnant. I sometimes (very few times) miss having my belly & feeling bebe Maximus kicking & having his little hiccup tantrums. I cant believe this wasnt that long ago! But I'm glad the pains are over. so bittersweet I suppose. Until next time, we'll enjoy going through my phone & seeing my pregger pictures. I cannot tell you how amazing it feels to be home for this long. Do not get me wrong, I miss my job, my office & coworkers; but I totally love being able to do things around the house, cook up random recipes & of course, play & cuddle with our little one. I'd love to hear some advice or comments on women that stay home or work with tiny ones. Maximus has met so much family since we've been home. It really makes me so happy to now have a large family to share with G. & our son. It's always been a dream of mine (really, ours now) to have a several little ones running around & get together with everyone for birthdays, holidays & random camping trips. Its weird because for me being such an independent person, I seriously adore the chaos that comes with having tons of family members. Another spoiled member of our little family, Captain K'Nuckles. Haven't really met another dog that enjoys taking baths & getting blowdried as much as this guy. Its so funny to see him pass out while his beauty grooming routine is happening. I haven't played video games as much with G. like we used to since I take momma duty very serious (lol). So since he gifted me a tablet a few weeks ago & we want to be lazy on the couch together on weekends, I've been doing some serious multitasking. This is one of my favorite things -- my parents redid their patio & hello... Maximus & I are obsessed with it. Every time we go visit grandma we like to sit & eat outside, enjoy the shade & take in the warm breeze. Even the pups love it! Can you spy Captain? Bath time is our favorite time. We sing, giggle & absolutely love the bubbles with warm water. I love how cuddly this one gets after getting out of the tub. Ek! Our niece wanted to come over & hangout with us for the day last week & it was awesome. We spent the entire day doing arts & crafts projects, snacking on poptarts & listening to bebe M. cutely snore. This is really my first time being an aunt (she's G.'s niece) so it's good to know how much she enjoys having our girl time with me. This past weekend we had an amazing time with our close family & friends celebrating my brother & sister-in-law's babyshower. Do you know how I had missed all of us getting together!? We are so over the moon waiting for baby A!! Totally looking forward to having all the bebes here for the holidays!!!!! 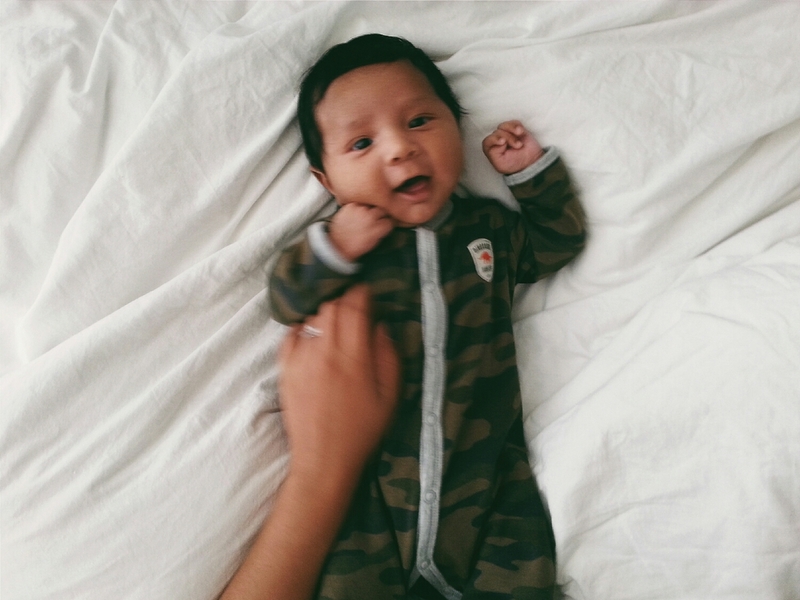 Turning 6 weeks yesterday, this little one now laughs & giggles at a lot of things. He enjoys being on his swing, being read to, pushing his legs on poppa's hands, cuddling in our bed on weekend mornings & taking car rides. Its amazing to see everything he can do in just a few short weeks. Gah, I adore this little one so much!! Jul 29 Meeting - Maximus G.